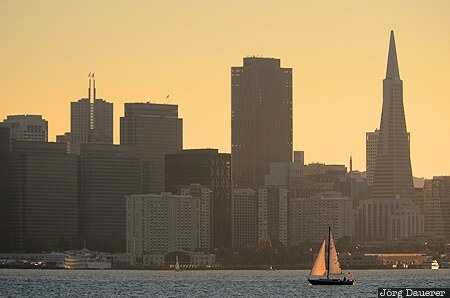 The skyline of San Francisco at sunset dominated by the Transamerica Pyramid and a lone back-lit sailing boat in the foreground seen from Treasure Island. San Francisco is in California in the west of the United States. This photo was taken in the evening of a sunny day in November of 2012. This photo was the image of the month in May of 2016. This photo was taken with a digital camera.